(TibetanReview.net, Jul09, 2017) – The 82nd birth anniversary of Tibet’s exiled spiritual leader, the Dalai Lama, was marked simultaneously on Jul 6 in the capitals of Taiwan, Malaysia and Singapore, connected by a concert held in the National Dr Sun Yat-sen Memorial Hall in Taipei. More than 3,000 people attended the concert in Taipei while 850 in Singapore and 350 in Kuala Lumpur observed the live-stream of the Blessing Concert. 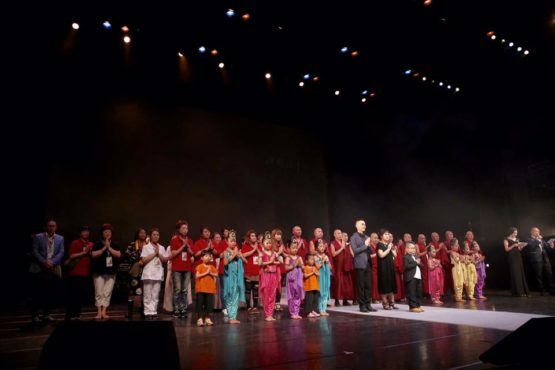 During the concert, participants in the three cities interacted with each other, said the Office of Tibet, Taiwan, in a report posted on the Tibet.net website Jul 7. The organizers – the Taipei Gaden Shartse Center – were unable to live-stream the Dalai Lama’s message during the concert due to poor internet connectivity in Ladakh where the Tibetan leader is spending all of July, giving religious teachings. His message was therefore conveyed by phone, and later translated into Chinese by Geshe Ngawang Tashi from the center. The four-hour-long concert was reported to have featured an array of religious and cultural programs. Former abbot of the Gaden Shartse monastery, Khensur Rinpoche Jangchup Choeden, attended the concert, as did the Central Tibetan Administration’s Taipei Representative Mr Dawa Tsering.